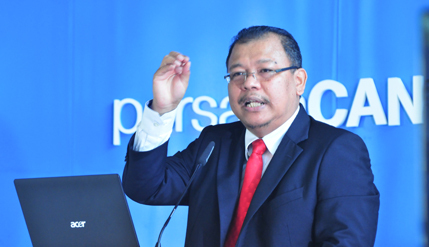 BANGI, 20 May 2014 – The National University of Malaysia (UKM) today unveiled a platform called PERSADA Canselori that will personify UKM’s role as the guardian of the nation. Vice Chancellor Prof Datuk Dr Noor Azlan Ghazali speaking at the launching of UKM’s 44th Anniversary celebrations here today said the platform located at the Foyer of the Chancellory will discuss pertinent issues affecting the country that is aimed at drawing the attention of the nation. He hoped PERSADA Canselori will not merely be a branding exercise but a symbolic gesture that will propel UKM to undertake its role as the guardian nation more seriously. UKM, Prof Noor Azlan said, is willing to go to the ground to fulfill that role saying that in the 44 years since its inception the university needed to adapt itself to stay ahead of the challenges going on in the world. He outlined six areas that UKM will focus on for improvements. One is to produce graduates sought after by the industry. This means shaping and moulding its students’ character and personality to such a stage that they carry themselves with distinction. Second is closer and more efficient collaboration with stake holders so that UKM’s impact can be felt and seen. Thirdly is producing high impact research. He said it does not matter how many discoveries are made but what counts is their impact. Discoveries must bring benefit to the nation to be truly meaningful and that would be more in line with the aspirations of its founders. Fourth is nurturing the culture of innovation in every prime mover of UKM which should be upheld by every single staff at all levels and departments. Innovation is not merely the prerogative of researchers but should also be taken up by departments like the Treasury or Security. Fifth is the creation of wealth and how to deal with budget reduction imposed on public universities. The problem could be solved by the academic staff undertaking consultation work. Currently UKM have more than 300 profesors which is 15% of its staff. Prof Noor Azlan believes that if all its professors decide to mobilise their expertise through consultancy work, UKM can generate more than the RM120 million it needed for its annual operations. And lastly some of its infrastructure needed to be upgraded to meet current needs. One example he gave was that students need not have to come down from their residential colleges to get online. He said the key measures needed to be carried out to ensure UKM will stay relevant while fulfilling its role as guardian of the nation and have the 3Rs – Relevant, Referred and Respected. The celebrations was launched by Chairman of its Board of Directors Prof Emeritus Dato’ Dr Mohammad Zawawi Ismail. Senior members of the University joined in the ceremony.